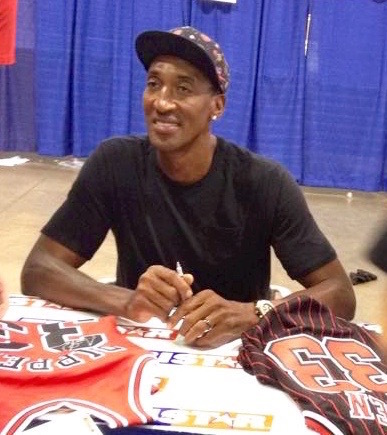 Above is an iFolloSports.com original photo of Chicago Bulls icon Scottie Pippen signing autographs at the National Sports Collectors Convention. The mega event was held at the Donald E. Stephens Convention Center, located in Rosemont, Illinois. iFolloSports.com Michigan correspondent Lance Martinez made the trek to suburban Chicago to cover the festivities. Pippen played 17 NBA seasons, winning 6 titles with Michael Jordan and the fabled Bulls teams of the 1990's. The 7-time All-Star averaged 16.1 points, 6.4 rebounds, 5.2 assists and 2.0 steals per contest. Those steal numbers helped the Arkansas native land on the NBA All-Defensive team a whopping 8 times. Pippen was elected into the basketball hall of fame in 2010. In addition, NBA followers can check out a photo of Pippen and a fan, at Los Angeles International Airport, submitted by the fan himself.